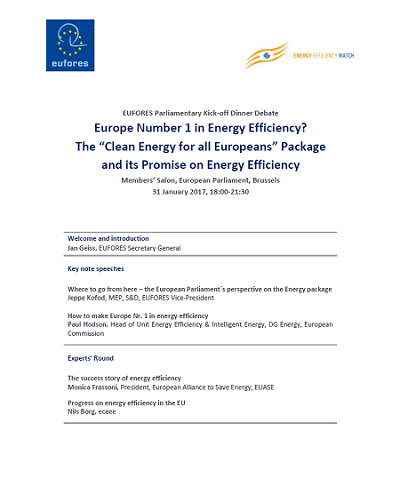 On the 31st January EUFORES organised a Kick-off dinner debate to discuss the outline of the “Clean Energy for all Europeans” package and the upcoming negotiations and views of involved members of the European Parliament. After the introductory speech of Jeppe Kofod (MEP, S&D, EUFORES Vice-President), presentations followed. Nils Borg (eceee) presented the progress of Energy Efficiency in the EU and stressed the need for strong institutional support for this policy as Energy Efficiency is invisible. Thereafter, Monica Frassoni (EUASE) argued that the successes in Energy Efficiency were possible on account of the framework created by EU legislation. In his opening remarks, Paul Hodson (European Commission) underlined that Energy Efficiency cannot be measured as easily as Renewable Energy Sources. However, he mentioned that we are reaching the point of comparing countries in Energy Efficiency in the same way it is done for renewable energies. He added that the progress achieved in Energy Efficiency is due to product policy; more specifically to ecodesing and building renovation and financing policies. The event was closed by an interactive panel discussion with Paul Hodson (European Commission), Bendt Bendtsen (MEP, EPP), Jeppe Kofod (MEP, S&D, EUFORES Vice-President), Jakop Dalunde (MEP, Greens/EFA), Niels Borg (eceee) and Monica Frassoni (EUASE). The discussion suggested that the upcoming review should develop a clear legislative framework and create more natural incentives to support the targets. Participation at this dinner debate is upon invitation only.